the performance of all students will improve, and the achievement gap will close. I. Curriculum & Instruction: Increase the academic achievement of all students through effective instruction, a challenging and engaging curriculum, and aligned assessments. A. Pre-K: Prepare pre-school children for success in elementary school by providing age-appropriate curriculum and instruction that nurture and develop children’s academic, social, emotional and physical well-being. B. ELA and Math Instruction: Prepare all students for continued success in English Language Arts and Mathematics by providing high quality instruction geared to student needs including appropriate modifications and accommodations. 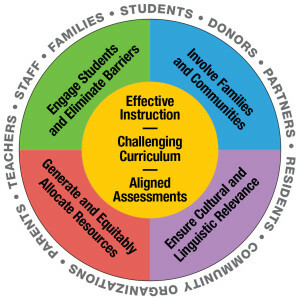 C. English Language Development: Provide direct instruction in English Language Development to ensure that every English Learner gains at least one English language proficiency level each year. D. Evaluation and Assessment: Use data from multiple measures to monitor student progress, guide instruction and evaluate the effectiveness of our programs, and share this information with the staff, the Board and the community. learning and interventions to eliminate barriers to student success. A. Student Engagement: Address the needs of the whole child by engaging students in the visual and performing arts, physical education and athletics, career and technical education, and gardening and cooking programs. B. ULSS / RTI2: Implement a continuum of academic, behavioral, and/or other intervention strategies through the Universal Learning Support System (ULSS), as ULSS is the district’s model of Response to Intervention and Instruction (RtI2). C. Positive Behavior Support: Develop and utilize a positive behavior system as well as prevention and intervention programs for specific behaviors that impede student success, such as alcohol and drug use and abuse, truancy, expressions of extreme anger, and repeated suspendable offenses. D. Disproportionality: Reduce the disproportionate racial representation of students suspended or expelled and students identified for Special Education services. E. Educational Options for Secondary School Students: Develop engaging and innovative educational options for secondary students, including career technical education. F. Extended Learning Opportunities: Provide students with academic enrichment and supervised activities that complement the classroom curriculum beyond the traditional school day. G. Transitions: Improve transitions for students as they move from pre-school to kindergarten, from elementary to middle school, from middle to high school, and from high school to post-secondary as well as the transitions from Special Education and English Learner status to the mainstream. III. Family/Community Engagement: Establish partnerships with our families and community to increase academic success for all students. A. Family Engagement Framework: Develop greater family involvement in the schools and the community by adopting a framework that offers multiple ways for parents to partner with educators to ensure their children’s success in school. B. Family Leadership & Advocacy Training: Strengthen parents’ capacity to be effective leaders in their schools and the community and advocates for their children by providing parent trainings and forums in formats that honor the cultures and languages of our community. C. Family Advisory Council: Support the City and the Berkeley Alliance in establishing a representative Family Advisory Council to ensure parent input in the development and evaluation of the 2020 Vision projects. D. Communication: Engage and inform our staff, families, and key partners by developing and implementing a comprehensive communications plan. IV. 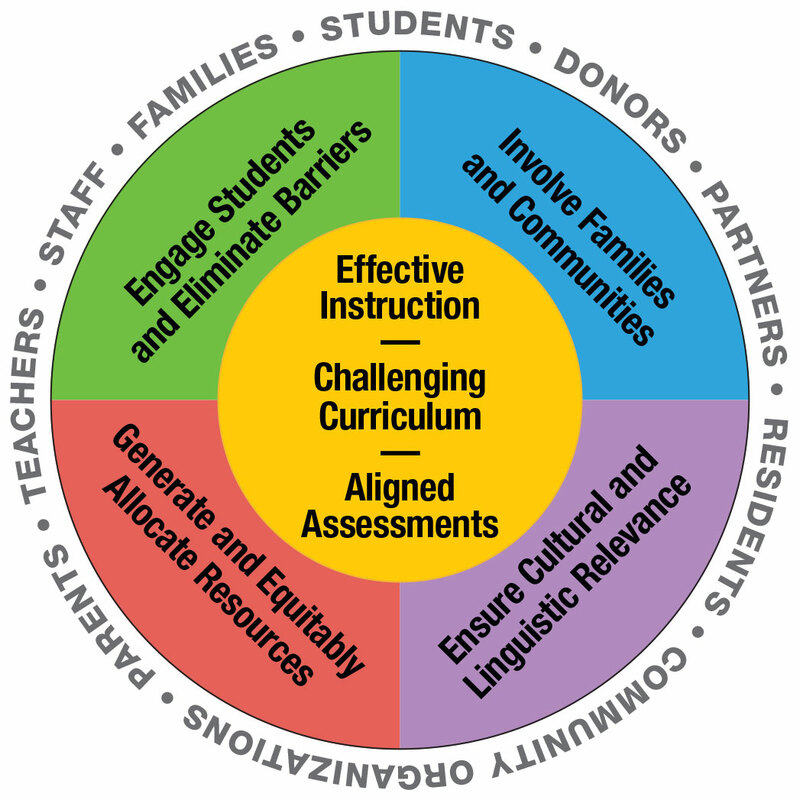 Cultural & Linguistic Relevance: Ensure that all systems are culturally and linguistically responsive to the needs of our students and their families. A. Culture and Climate of District and Schools: Ensure that all schools and departments welcome and support all our students and their families by prioritizing a focus on equity at each site, ensuring customer friendly service, and providing language access, all supported by district policy. B. Recruit and Retain Teachers and Administrators of Color: Develop and invest in prospective and current teachers and administrators of color by identifying career pathways and establishing networking, mentoring and other support systems. C. Professional Development: Create a culturally and linguistically responsive climate throughout the district through focused professional development. V. Resources: Generate and equitably allocate resources for programs and services that enable every student to succeed. A. Efficient Use of Resources: Improve and streamline District-wide systems, services and operations through the use of enhanced tools and technology that will provide additional time and resources to meet current and future student needs. B. Parcel Tax and Bond Revenues: Provide the best possible education for all students by effectively utilizing local parcel tax and bond revenues. C. Partnerships: Maximize public and private resources to support greater student success by strengthening partnerships with the City, the Berkeley Alliance, the Berkeley Public Education Foundation, U.C. Berkeley, and other stakeholders.